Gwilym Simcock has just spent the week preparing for two concerts with the LSO Percussion Ensemble. Photographer David Forman went to the Friday lunchtime one, and I went to the Saturday night. One of the works was Steve Reich's Quartet from 2013 for two pianos and two vibraphones. Reich has written: "The piece is one of the more complex I have composed. It frequently changes key and often breaks off continuity to pause or take up new material. Though the parts are not unduly difficult, it calls for a high level of ensemble virtuosity." That's only part of the story. Because vibraphones are normally tuned to 442 (and pianos are not) it needs a re-tuning of the pianos. This venture had, and needed!, the support of Yamaha UK. The LSO Percussion Ensemble has made one CD of Reich works, issued on the LSO Live label, but not this one. Last night's concert was recorded and this Reich work and the remainder of the programme will form the basis of a second CD. The other works in the concert were arrangements by Simon Carrington of Chick Corea's Duet-Suite (from the 1979 ECM album with Gary Burton, Duet) and of Makato Ozone's Kato's Revenge, both of which have had the seal of approval from their composers. There is also an arrangement for the group of Joe Locke's Her Sanctuary, by Joe Locke who was there. Gwilym Simcock has also arranged Barber Blues for the group. The most substantial new work is a five-movement Suite by Gwilym Simcock, commissioned by the ensemble. It consists of (1) an introduction, (2) a movement inspired by Don Grolnick/Steps Ahead's Pools, (3) a movement inspired by Yellowjackets' Livewires (4) and interlude, on which Neil Percy plays Hang Drum, and (5) a movement inspired by Weather Report (with Percy on drum-kit). 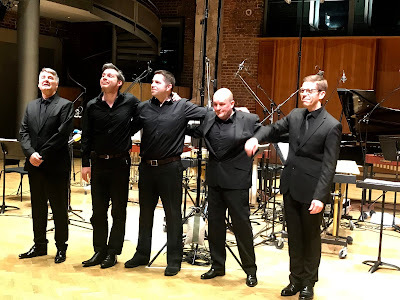 The LSO Percussion ensemble is made up of Neil Percy, David Jackson, Sam Walton and Simon Carrington, and the second piano on the Reich was played by Joseph Havlat. These are busy times for Gwilym Simcock. He spent the previous week in Hamburg with the NDR Big Band, where he is composer in residence, working on his third commission from them, Sawgrass Suite, which will be premiered in Hamburg later in the year (details). He also has a solo piano album for ACT entitled Near and Now for release in May (disclosure of interest, I wrote the press release for the album).